Be sure that all previous applications of paint have thoroughly dried. Next, I have used Burnt Sienna to warm some areas an add the under-painting for some of my shadows. This application of paint should be very wet. 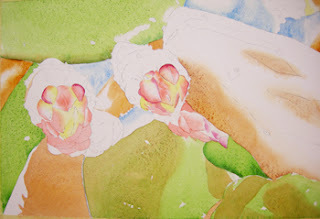 Don't brush too much over previously painted areas or you will dig up and stir up the pigment layers. Try to apply the wet paint for each layer or glaze with a very light touch, and quickly drop it in. Your brush should just push the puddles of wet paint around. It should barely even touch the paper, if at all. Using a delicate touch will preserve the previous glazes of color and each glaze will stay fresh and clean. You can view previous posts to see the beginning of this lesson. Just click on the archives at the left of this page.